JCPenney is in serious trouble. There's no sugarcoating it. The department store chain, famous for its Christmas catalogs, is losing money — and customers. It has a lot of debt. And not much cash. A dismal earnings report on Thursday only reinforced that time is running out. JCPenney (JCP) reported an adjusted loss of $69 million in the first quarter, even worse than Wall Street was expecting, and lowered its projections for the year. Sales fell 4%, also missing estimates. Much like floundering rival Sears (SHLD), JCPenney is struggling to adapt to the changing retail landscape as people increasingly shop on their phones. Earlier this year, JCPenney announced it will cut 360 jobs at its stores and corporate headquarters. That's on top of more than 5,000 layoffs in 2017, after JCPenney decided to close nearly 140 stores. It has about 860 left. JCPenney just can't keep up with Amazon (AMZN), which is dominating the digital retail world. Some other traditional retailers, including Walmart (WMT), Target (TGT), Best Buy (BBY) and Macy's (M), have taken steps to remain competitive — and have been rewarded by investors. 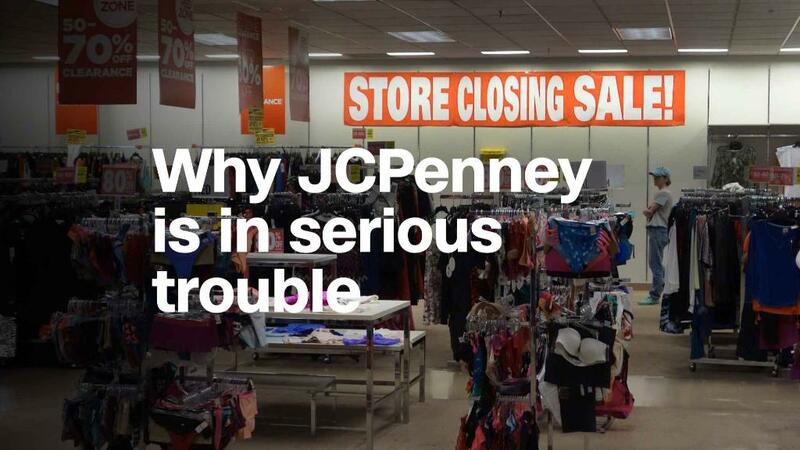 But JCPenney is lagging, and investors are running out of patience. Another troublesome sign: The company blamed bad weather for some of the weakness. CEO Marvin Ellison said one reason for the poor sales was "a very late start to spring where we experienced cooler than normal temperatures in April." That sounds like a bit of an excuse. Macy's, which reported strong results on Wednesday, didn't think the cold and snow was a problem. CEO Jeff Gennette told analysts that "we didn't see really any material difference in our business based on weather." Shares of JCPenney plunged 10% early Thursday morning and now trade for less than $2.80 a share. That means JCPenney is now a penny stock, Wall Street jargon for a company with a stock price in the low single digits. Perhaps the most worrisome thing for JCPenney, though, is that it appears to be running out of both cash and time to fix things. The company lowered its earnings forecast for the year to 13 cents per share at best, and said it could lose as much as 7 cents. Wall Street was looking for a profit of 19 cents. JCPenney finished the quarter with just $181 million in cash, down from $363 million a year ago. Much of the big decrease was because of a $190 billion debt repayment. But JCPenney is adding even more debt. It raised $400 million from recent bond sales. Although the company stressed in the earnings report that it has $2 billion in total liquidity, it also has more than $4.1 billion in long-term debt, up slightly from the same period last year. Ellison stressed during the conference call that JCPenney will be able to get back on track. He highlighted a partnership with beauty and jewelry goods leader Sephora, as well as JCPenney's recent moves to start selling toys and appliances. The numbers don't lie, though. Continued red ink and a high debt load are a huge problem. That's why Wall Street thinks the clock is ticking for JCPenney. It needs to get sales back on track sooner rather than later.